Quick and easy to make, this flavorful dessert features both tartness and sweetness in a winning combination. If you can’t find real Florida key limes then two regular limes will suffice… but they’re not quite the same. Likewise, you can use a store-bought graham cracker crust (or pastry shell), especially if you’re pressed for time. Mix the cracker crumbs, sugar, and butter in a small bowl. Press the crumb mixture into a 9.5″ pie plate – make sure it reaches the top edge! – and bake for 7 minutes. Cool for 30 minutes. Whisk together the condensed milk, sour cream, lime juice, and lime zest in a medium bowl. Pour into the prepared shell and bake for 10 minutes. Let the pie cool slightly and then chill for at least 3 hours for best results. 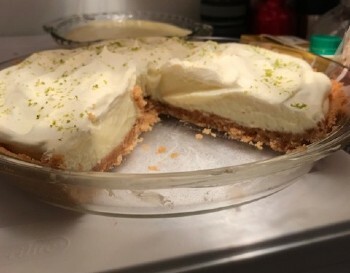 Top with freshly-whipped cream, a sprinkling of lime zest, and watch it disappear!